Bangor City FC Supporters Association reminisce about the club’s foreign adventures | News by Wales Express News, People Before Profit! Iorys Griffiths defending with goal keeper, Len Davies behind him and captain Ken Birch watching from afar. 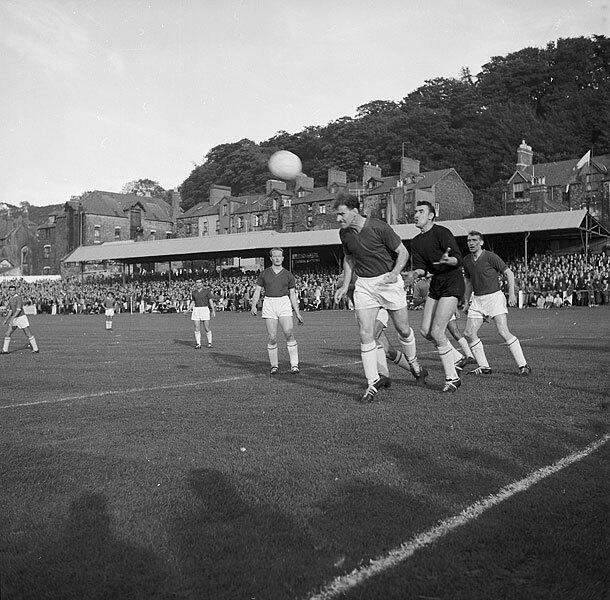 Image from Geoff Charles’ collection from the 1962 AC Napoli game in Farrar Road through the kindness of the National Library of Wales. Atlético Madrid… HJK Helsinki….Widzew Lodz… FC Midtjylland…. what have all these teams got in common? They have all played against Manchester United FC, and have played against Bangor City Football Club! These adventures and the memories of the club’s supporters have become part of Bangor folklore, a romantic period of Wales’ football history, and the reason why Bangor City Football Club Supporters Society have decided to co-operate with STORIEL, the new Gwynedd Museum and Gallery to showcase the history. STORIEL is jointly led by Gwynedd Council and Bangor University. Bangor City Football Club Supporters Association were invited to be the first local group to use the dedicated space at Storiel for community groups. This is a space assigned to allow community groups to share Gwynedd’s story through specific themes. This is part of a project to allow the people of Gwynedd to have better access to Bangor University and the Museum’s collections. Small exhibitions will shortly open across the county soon as a different part of the project. Iorys Griffiths, local star of the famous football game against AC Napoli in 1962, the first game that Bangor played in Europe, recently went along to STORIEL to enjoy the exhibition with his cousin and another of the team’s previous players, the actor John Ogwen. STORIEL is open from Tuesday to Saturday from 11am to 5pm.